The hardest part about this recipe was to stop nibbling the pumpkin seed crunch once it had been toasted. It’s a bit like peanut brittle but with a delicious tang from the cumin and pumpkin seeds instead of peanuts. Very hard to resist. Although this salad is really nice cold, it is at its best whilst still warm. 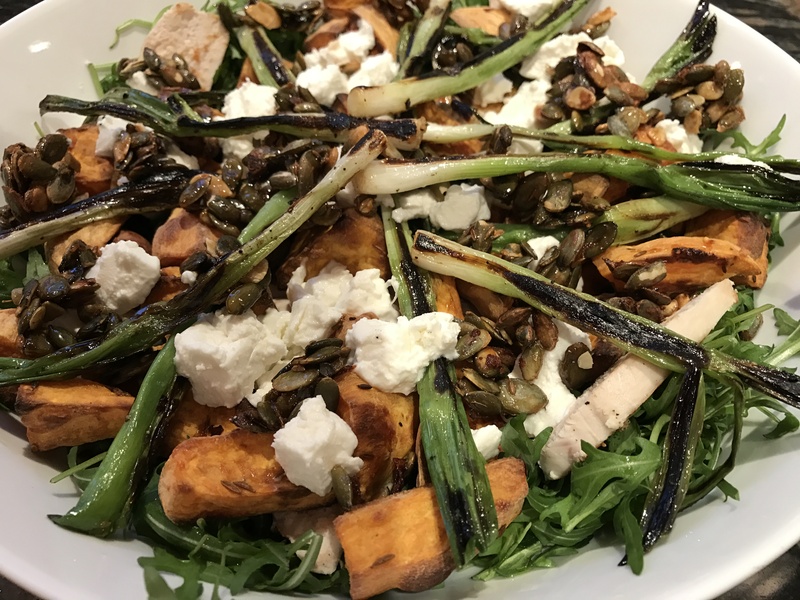 The combination of warm sweet potato and griddled spring onions with the soft melting goats’ cheese and the crunch of the sweet/savoury pumpkin seeds added to the peppery rocket with the lemon juice just coming through is absolute heaven. I added a sliced chicken breast to the original recipe to add more protein for my husband. In a large bowl, toss the sweet potato with half of the oil, cumin seeds, chilli flakes, garlic and seasoning. Spread on to a baking tray and bake for about 40 minutes at 200°C, turning over half-way through baking. If using chicken, half-way through cooking the sweet potato, place the chicken breast fillet on a baking tray and pop into the oven. Bake until cooked through but still moist – about 20 minutes. Alternatively, use a ready-cooked fillet or cold chicken from a joint, slice it and quickly sauté it after griddling the onions. 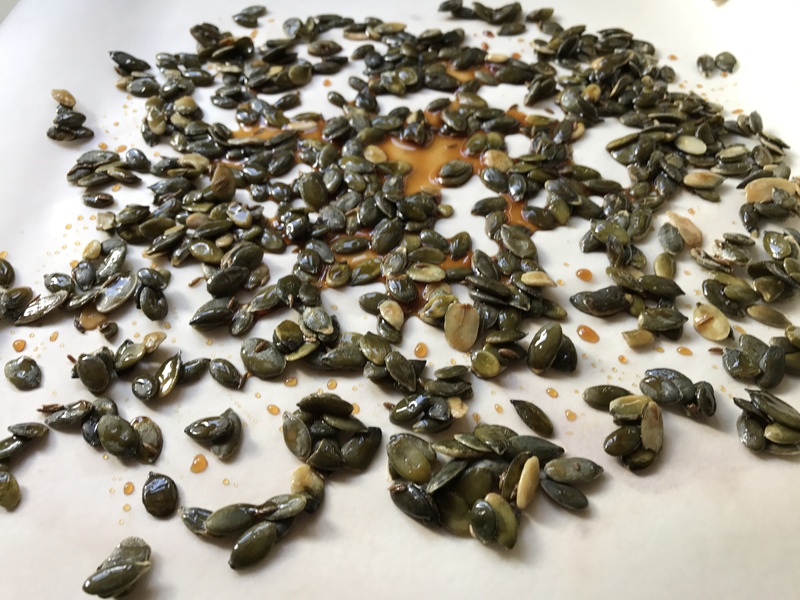 To make the crunch – mix the pumpkin seeds with the cumin seeds, tamari and maple syrup. Spread on a parchment-lined baking sheet and bake for about 8 minutes until lightly toasted. Set aside to cool and then break up into pieces. 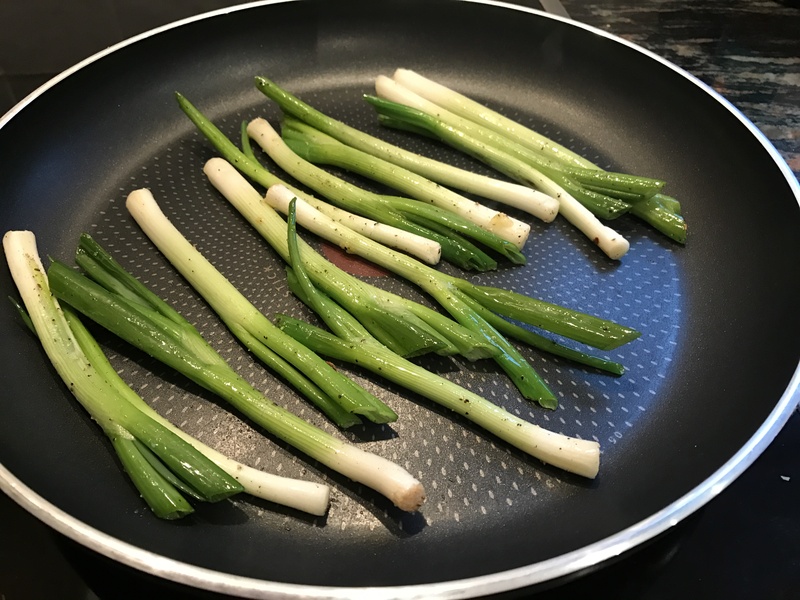 A few minutes before the potato and chicken are cooked, heat a fry pan on the hob, toss the spring onions with ½ tablespoon oil and griddle them for about 4 minutes. Turn them over and cook for a further 4 minutes. Toss the rocket leaves with the remaining oil and lemon juice. Arrange on plates, or in a large bowl, and pile on the sweet potato, sliced chicken and spring onions. Sprinkle with the crumbled goats’ cheese and the pumpkin seed crunch. Best served whilst still warm. Recipe adapted from Sainsburys Magazine. This entry was posted in Dinner, Salads and tagged Chicken, Chilli, Dinner, Garlic, Gluten Free, Goat's Cheese, Healthy Eating, Lunch, Rocket, Salad, Spring Onions, Supper, Sweet Potato, Wheat-Free. Bookmark the permalink.